There are few things in the world that I find quite as beautiful as adoption. At its core adoption gives a child a chance to be raised in a loving home with parents that are overjoyed at the chance to love them and sacrifice for them. This is indescribably better for the child than growing up in an orphanage or being raised by parents who aren’t in a position to accept the responsibility. This is a game changer for these kids and the whole world benefits when kids are raised by loving, engaged parents. Recently some friends were blessed with an adoption miracle of their own. I’m ECSTATIC for them. I asked if they would be willing to share their story and they were gracious enough to say yes. The story below is part one of a two part story written by my friend Christy that will grab your heart and bless you. Some details have been removed to protect those involved but the story is just as powerful without them. One last note – if you have an adoption miracle of your own that you would like to share with the world it would be my great honor to publish it for you. These are the most beautiful stories in the world and I would love nothing more than to publish a vast collection of stories that could be used as a reference for others who are thinking about adoption. My whole life I’ve been one of those annoying overachievers. When I should have been clinging to my mommy’s leg on the first day of pre-school, I was making demands. “I want to learn to tie my shoes and write my name!” My teachers had received their orders. In junior high school I was an officer in our FBLA (Future Business Leaders of America) club and was convinced that my calling in life was to be the boss and I didn’t bother myself with the details like where or boss of what. Ahhh, young idealism. Then I moved on to high school and kept up a pretty busy extra curricular calendar. I even got in trouble. Once. Kind of. I may have distributed the home phone numbers of all the school board members urging students and parents to call to express their views on one specific topic. I put my full self into everything I did. Then I fell in love for the first time and put my whole self into that. Everything changed. Slowly the need to be successful in a career was replaced by the need to have a family of my own. More than anything in the world, I wanted to be a mommy. I could be a working mommy—something like having my cake and eating it too. It would be many years later when I realized that MY plans and GOD’s plans for me were not aligned. So I prayed and prayed for God to get on board with my plans. I wanted to be pregnant so badly. Being pregnant was my right as a woman. I paid my dues to womanhood every month like the rest of womankind. I was ready to cash in and move to the next step. It would take many years for me to get with God’s plan. I’m strong-willed and pretty stubborn but lucky for me, God is loving and patient. And so He waited while I learned the hard way. God’s timing is perfect. Not Christy’s timing. God’s timing. We were in the switchbacks of some line passing baby after baby and I had a moment. I want to be a mommy MORE than I want to be pregnant. At age 30 I married my prince charming. My wonderful husband knew that I had been unable to get pregnant in my previous marriage and he accepted me no matter what. “We could always adopt” he’d say. Well, yes of course, but I really wanted to have a baby that would be me + him. Our baby. I imagined what she would look like, what we would name her, what she’d be like. The best of both of us wrapped into one perfect little angel. I started by talking to my regular OB/GYN. Because of my age and my history, he referred me to a fertility specialist. It was about 10 months into our marriage when we finally had our first appointment. We sat in the waiting room with other couples, not making eye contact but trying to compare ourselves to everyone else. We’re younger than they are, age must be their problem. They’re larger than we are, weight must be their problem. They are younger and thinner than we are, why are they here? All of it was utterly ridiculous of course. But when you’re unable to get pregnant you really need an explanation as to why, so you make up your own reasons no matter how irrational you know they are. The specialist diagnosed me with PCOS—Polycystic Ovarian Syndrome. It’s a very common condition and we discussed a plan of treatment. We’d try plan A for three months and then, if necessary, move to plan B and then after three months, we could try plan C. And at any time, we could always talk about IVF (invitro fertilization). It was all very clinical. Get. Woman. Pregnant. Repeat. The painful ending of another two week wait. Every month we’d experience the TWW—two week wait. It’s the time from when you try to concieve and the two weeks later when you take a pregnancy test to see if it worked. We bought the multi-pack pregnancy tests. They were always negative. Always. And every time I’d pee on that little stick my heart would flutter and we’d try so hard not to hope so damn much. But we did. And it sucked. Infertility is not covered by insurance so we got fairly deep in debt trying to achieve pregnancy. We even ordered medication from the UK because the medications in the US are so much more expensive. I learned to give myself injections. I learned a lot about my body but I still didn’t know why nothing was working. I am an overachiever! Why didn’t my ovaries get the message?! What I didn’t realize then but I do realize now is this doctor’s job was to make a baby, not find out why I wasn’t getting pregnant. You might think, umm, Christy, isn’t that the same thing? It’s not. After about 15 months we needed a break—emotionally and financially. Right about that time my sister mentioned (again) that I should go to this introductory session at church about the Creighton Fertility Model. My mom had tried to talk me into this many months ago but what could my church know that my expert doctors didn’t already know? Turns out, it was a lot. It was science and it made so much sense. Just because the doctor was Catholic and it was my church that was presenting his research didn’t negate the medical science. We left this meeting energized, renewed and filled with hope! There were some “ah-ha” moments. Why didn’t my fertility specialist talk about these things? The Creighton Fertility Model is a model for women’s health. It focuses on the woman’s health and (among other things) the root cause of the infertility. Brilliant! With this program, I learned more about my body than any one doctor EVER could have figured out at the fertility specialist’s office. We got a new doctor who is wonderful! He has an amazing success rate and I just knew this would work. I allowed myself to hope again. We tried different medications. I had a laparoscopy surgery that found and removed some endometreosis. My hubby learned to give me injections that I couldn’t give myself. But still no baby. (To this date, I think we’re the only non-success case for our doctor.) God’s plan. God’s timing. Someday this will be a happy place to visit! Throughout my years of infertility I was blessed with God’s grace. Though there were many sad and painful moments, I was never bitter or withdrawn. I was genuinely happy when my sisters were pregnant. I was genuinely excited to go to baby showers for friends who were expecting. 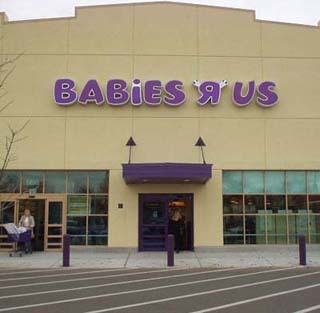 Babies R Us was sometimes hard to face but for the most part, my sad moments were private and short-lived. It is truly a roller coaster ride of emotional ups and downs, twists and turns. In March 2010 we were at Disney World for my step-son’s 7th birthday. At Disney World there are babies EVERYWHERE. My husband and I had been trying to have a baby for over three years. We were in the switchbacks of some line passing baby after baby and I had a moment. I want to be a mommy MORE than I want to be pregnant. This was a huge revelation for me. A peaceful acceptance. I didn’t hear angels singing in the clouds, but it was a defining moment. Did I still hold hope for a pregnancy? Absolutely. But I was done waiting. I was done putting off things in my life “just in case” I would be pregnant. I was ready to seriously explore adoption. How could I continue to pray to God for a baby and then completely ignore the option of adoption? Have you ever heard the expression—“tell me what you want or tell me how to do it, but don’t tell me both.”? By focusing so much on the pregnancy, I was trying to tell God the HOW (pregnancy) when I actually was looking for the WHAT (my baby). God must’ve been banging His head against the wall. “Girl, you are so thick headed!” Yes I am, Lord. Thank you for waking me up. Let’s do this. Posted on July 21, 2012, in Real Life and tagged Adoption, Adoption Miracle, family, fertilization clinic, God, God's Grace, Health, Home, IVF, OB/GYN, orphanage, Pregnancy, trouble getting pregnant. Bookmark the permalink. 5 Comments. Just a heart breaking story so far…but like all good stories, I feel like light is coming over the darkness. I look forward to part 2. I truly believe that there should be a Christian (faith based) ministry that helps women who are going through fertility struggles. It should be organized by women who have had successful feritlity experiences and unsuccessful experiences who are all grounded in faith. Christy, I applaud you for putting your story out there is such a public fashion. I am looking forward to part 2 as well. Bob, you are so right. In my close ciricle of friends there are many common threads through the infertility struggle. I started to think it’s a silent epidemic. It’s amazing to me the Creighton Model and Naprotechnology aren’t more well-known since the success rate is so high. I’m not a good example because I didn’t persue it to it’s full potential. Once I heard God’s call to adoption, I saw my path. Faith is such a big part of the journey–even when you don’t realize it!